Turning the Tide is a grassroots effort spearheaded by the Social Environmental Alliance (SEA) in concert with several local and national partners. As an organization SEA has a local reputation for “punching above it’s weight”. With a small annual budget and completely volunteer based activism, we have been instrumental in several major campaigns, always working in coalition with local First Nations and other environmental and social justice groups. In recent years, we helped form the Farmland Protection Coalition to fight proposed changes to the Agricultural Land Reserve, mobilized with teachers and labour unions to support workers’ rights and public education, and assisted with local organizing efforts in solidarity with the Women’s March on Washington and global advocacy for peace and human rights. 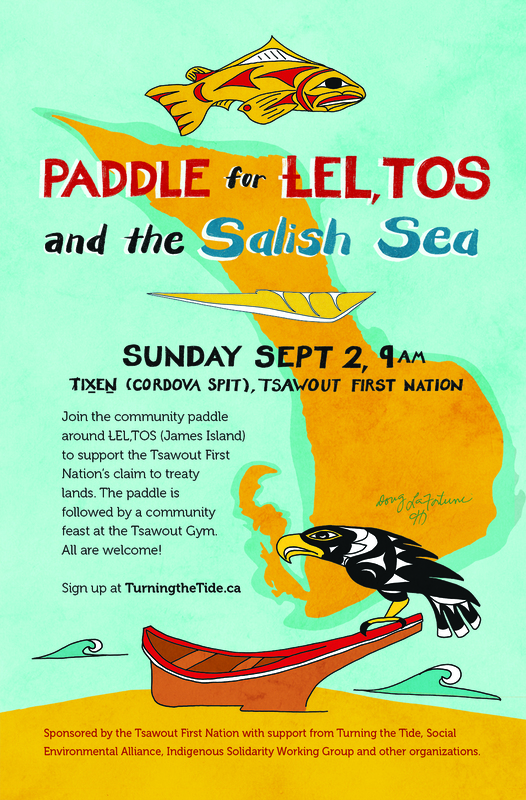 We have also been instrumental in helping to organize campaigns in support of indigenous rights, including efforts to protect Grace Islet in the Salish Sea and restore traditional Coast Salish place names in the capital region, in particular Reclaim P’kols (Mt. Douglas). Partnering with the environmental movement, we have supported campaigns to protect the Walbran Valley and establish legislated protection for the Old-Growth Rainforests on Vancouver Island. Committed to the vision of “People and the Planet Before Profit,” we have organized numerous public educational and cultural events featuring noted expert speakers and artists.